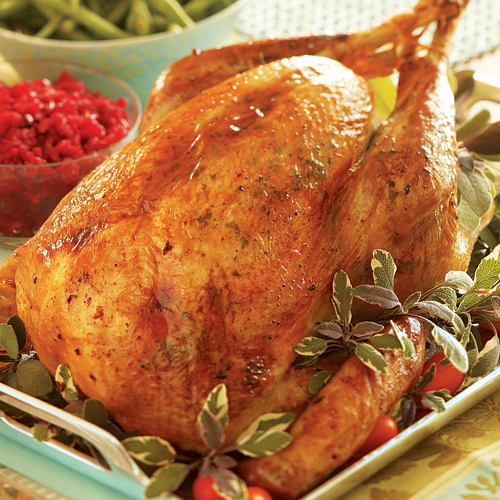 Click the image to watch a video on how to brine a turkey. Roasted turkey breast, sautéed pork chops, and stir-fried shrimp all tend to suffer a common fate when they’re cooked even a few minutes longer than necessary: they get dry and tough. Actually, any kind of meat or fish will taste like shoe leather if it’s severely overcooked, but turkey, pork, and shrimp are particularly vulnerable because they’re so lean. Luckily, there’s a simple solution (literally) for this problem. Soaking these types of leaner meats in a brine—a solution of salt and water—will help ensure moister, juicier results. 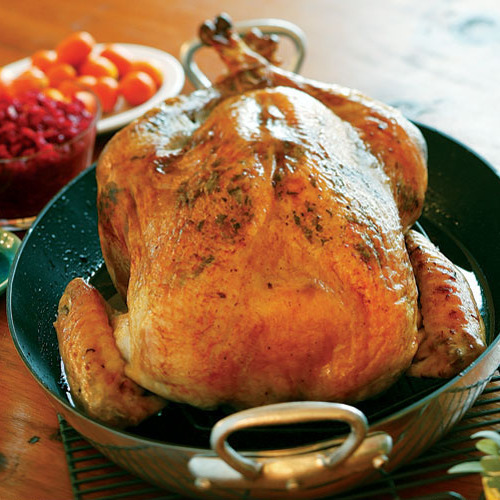 For more turkey know-how, see our 21 Tips for Better Turkey and visit The Guide to Thanksgiving Dinner to watch videos demonstrating how to brine a turkey using a wet-brine method and a dry-brine method. Moisture loss is inevitable when you cook any type of muscle fiber. Heat causes raw individual coiled proteins in the fibers to unwind—the technical term is denature—and then join together with one another, resulting in some shrinkage and moisture loss. (By the way, acids, salt, and even air can have the same denaturing effect on proteins as heat.) Normally, meat loses about 30 percent of its weight during cooking. But if you soak the meat in a brine first, you can reduce this moisture loss during cooking to as little as 15 percent, according to Dr. Estes Reynolds, a brining expert at the University of Georgia. Brining enhances juiciness in several ways. First of all, muscle fibers simply absorb liquid during the brining period. Some of this liquid gets lost during cooking, but since the meat is in a sense more juicy at the start of cooking, it ends up juicier. We can verify that brined meat and fish absorb liquid by weighing them before and after brining. Brined meats typically weigh six to eight percent more than they did before brining—clear proof of the water uptake. 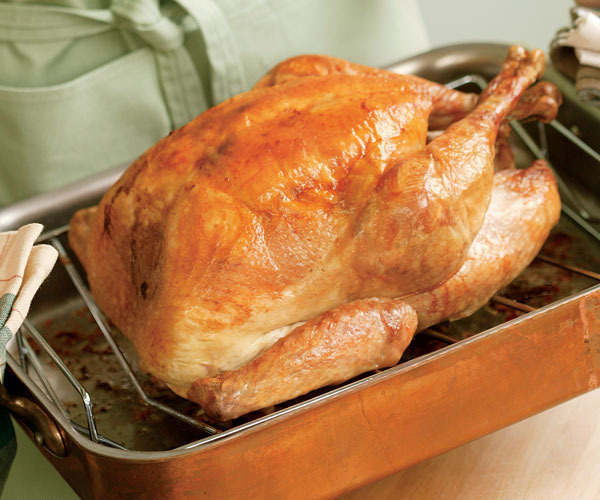 Another way that brining increases juiciness is by dissolving some proteins. A mild salt solution can actually dissolve some of the proteins in muscle fibers, turning them from solid to liquid. Of all the processes at work during brining, the most significant is salt’s ability to denature proteins. The dissolved salt causes some of the proteins in muscle fibers to unwind and swell. As they unwind, the bonds that had held the protein unit together as a bundle break. Water from the brine binds directly to these proteins, but even more important, water gets trapped between these proteins when the meat cooks and the proteins bind together. Some of this would happen anyway just during cooking, but the brine unwinds more proteins and exposes more bonding sites. As long as you don’t overcook the meat, which would cause protein bonds to tighten and squeeze out a lot of the trapped liquid, these natural juices will be retained. Any lean, dry meat is an ideal candidate for brining; some of my favorites are shrimp, fish fillets, chicken pieces, whole chickens, and pork chops. Keep all meat and fish refrigerated during brining, rinse them well afterwards, and don’t overcook them. If you need more liquid to completely submerge the meat, measure more and add it, along with the proportionate quantity of salt. 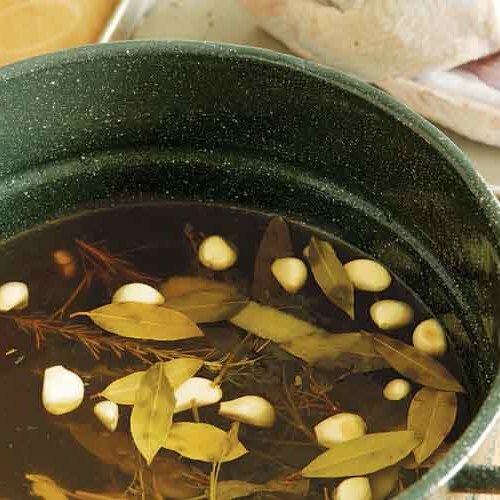 You can add dried herbs, such as thyme, oregano, or sage, to the brine or rub them directly on the meat for more flavor. 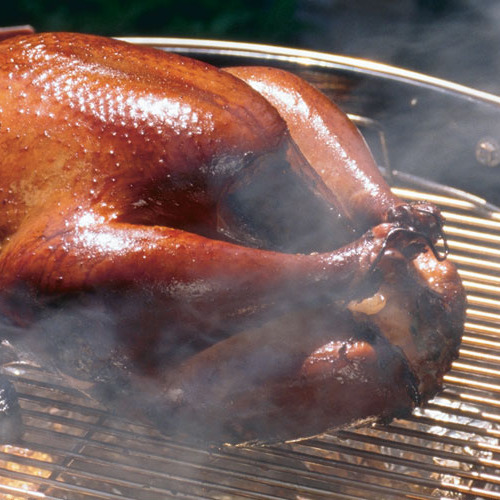 You can also supplement or replace the water with another liquid, such as apple cider for a turkey or pork brine. Many brines include sugar, which is fine as a flavor enhancer. But according to Dr. Reynolds, sugar has no technical function when it comes to juiciness; salt is the key ingredient. 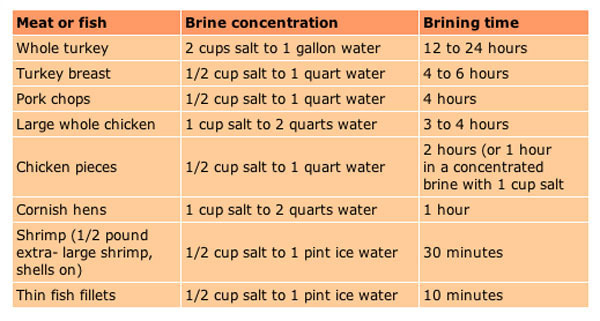 The chart below gives salt concentration and brining time for various foods. Concentrations listed are for Diamond Crystal kosher salt. For table salt, cut salt amounts by 1/2; for Mortons kosher salt, cut amounts by 1/4. It’s vital to have a brine with the correct salt concentration, especially for lengthy brining times. Small, thin pieces of meat like fish fillets or shrimp can withstand a concentrated brine because they’ll be immersed for only half an hour or less. 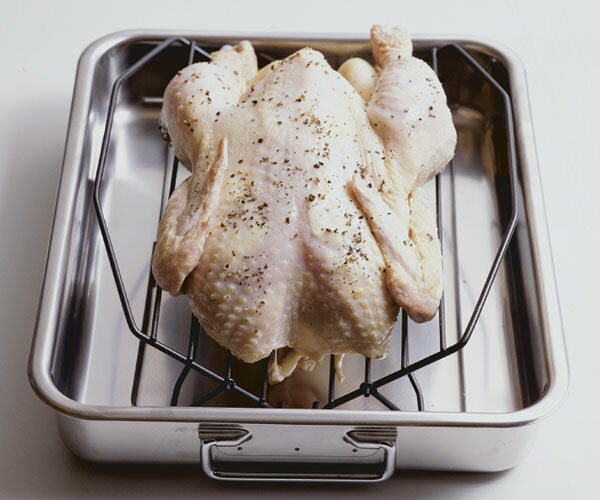 But for longer brines, Dr. Reynolds suggests using 9.6 ounces of salt for every gallon of water. One scant cup of table salt per gallon of water would put you within range. If you’re using kosher salt, you’ll need to use more of it by volume. This is because kosher salt has larger crystals and is bulkier than table salt. I actually prefer using kosher salt in brines because it dissolves much faster, and it comes in nice big cartons. Using Diamond Crystal kosher salt, you’ll need 2 cups per gallon of liquid. Morton’s kosher salt is denser, and you only need 1-1/3 to 1-1/2 cups per gallon of liquid to get the brine concentration that Dr. Reynolds recommends. Any food-safe nonreactive container is fine for brining. For brining turkeys, I use a plastic turkey cooking bag that will completely enclose the turkey; the meat needs to be completely submerged. I put the turkey in the bag and then set the whole thing in a large bowl. I add water to the bag with a measuring cup, keeping track of how much I’ve added. Then I add the correct amount of salt. If I’m brining a familiar turkey size and I know the approximate amount of salt, I just rub the salt directly on the turkey, inside and out, before adding the water. I put the bowl in the refrigerator (all meats should be refrigerated during brining) and let the meat soak for 12 to 24 hours. Discard the brine after use; for safety reasons, it should never be reused. Remove the neck, giblets, and tail (save these for stock) and any plastic bits like leg connectors or pop-up timers from the turkey. Rinse the turkey well and put it in two doubled-up turkey-size oven bags. Rub 1 cup of kosher salt on the turkey inside and out. Pour in 1 gallon of cool water and close up the inner bag as tightly as possible with a twist tie. Secure the outer bag with another tie, and gently shake the whole thing around a bit to wet all the salt. Put the bagged turkey in a roasting pan (to catch any leaks) and refrigerate for 12 to 24 hours, flipping the turkey once or twice. Rinse the turkey well and pat dry with paper towels. (To roast the turkey, try this simple method). 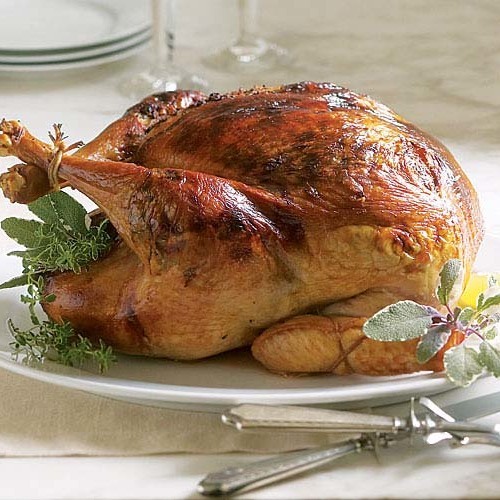 One more note: If you’ve bought a kosher turkey, there’s no need to brine it yourself as it has already been brined during processing. Whatever you’re brining, remember to rinse the meat or fish well afterward to remove any surface salt. Properly brined meat shouldn’t taste salty, just very juicy with good flavor. But do reduce the amount of salt called for in the recipe; that is, don’t add salt until the dish is at a point where you can taste it and judge. I brined my turkey for 4 days prior to Turkey day in fridge. My 22Lb stuffed bird was fully cooked in 4 hrs. I couldn't believe it as package said 5-6 hrs unstuffed.